At the end of September, 42 teachers, 54 school pupils and 45 members of university and science centre staff from 10 European countries met in Kiel, Germany for the final conference of the European IRRESISTIBLE project. The project involved developing and delivering teaching modules about current science. During the modules, the pupils developed exhibits on what they had learned. Each country selected its best exhibits and brought these to Kiel. The conference began on the Friday morning with sessions in which the teachers and pupils discussed their experiences of the project. The teams spent the afternoon setting up their exhibits for the IRRESISTIBLE exhibition, which opened to the public that evening at the Researchers Night at the University of Kiel. The very blue exhibition floor attracted plenty of attention from the 2000 plus visitors who came to see the various exhibits. The visitors spent a long time talking to the pupils who had created the exhibits. 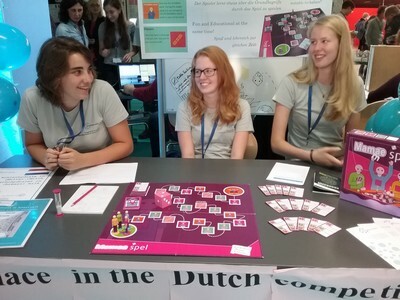 Our two Dutch exhibits, the bookcase and the Mammae game, the winning exhibit from the Netherlands, attracted a lot of interest. The teachers and pupils from the different countries also had more time to talk about their experiences of the project. Some schools already made plans for future exchange projects beyond the scope of the project, like the Dutch school that is already planning an exchange with a school from Kiel during this school year. All in all, a successful and entertaining IRRESISTIBLE conference! The European IRRESISTIBLE project began three years ago, with Science LinX taking the lead. In this project, teaching modules are developed in 10 different countries on current science and ethical aspects of research. These modules have been translated into different languages and are used in schools throughout Europe. In total, some 40 teachers and 600 pupils participated in the project in the Netherlands. All of the modules can be downloaded from our website. For information about the Dutch modules, contact Eva Teuling.